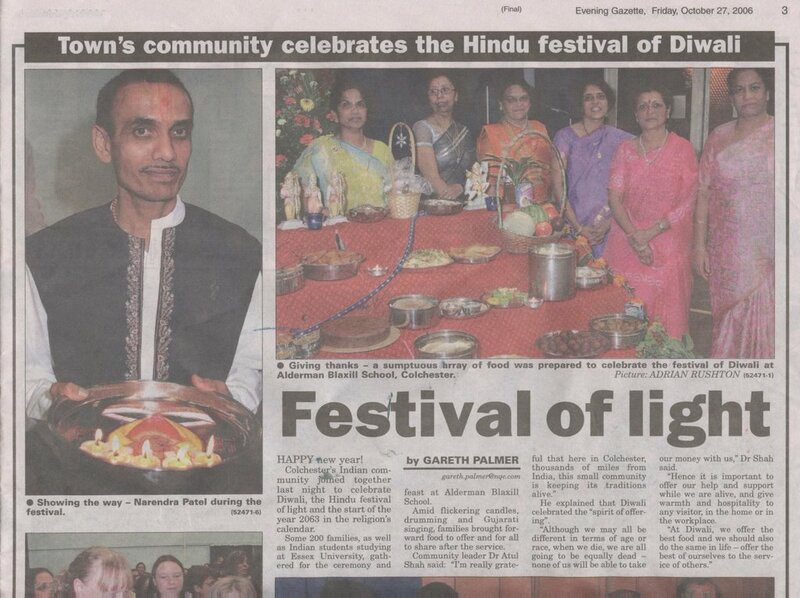 Diwali is increasingly popular in Britain. The Lord Mayor of London, Mr. Ken Livingston organised his fifth annual Diwali party for Londoners at Trafalgar Square and it was a massive success. 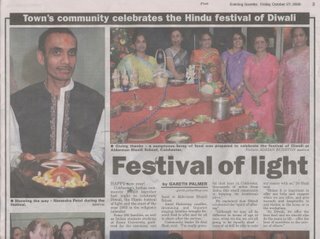 Even in our own small town of Colchester, Diwali was a big hit and we celebrated it at School (through an assembly for infants at Prettygate School), with the community (through an Ankut gathering at the local school) and at home, through a Diwali party for our children's friends. This year, I decided to focus on the subject of offering and hospitality, a value which is capable of Universal appeal. Some of my British friends have honestly told me that they are bad at hospitality and really need to learn how to receive others and welcome them and provide for their welfare. I spoke on Indian hospitality and how its central message of sharing is replicable and truly does not lead to loss but to gain and strength. At Prettygate Infants school, I gave the example of candles and how when we light one candle with another, the first candle does not lost its light, but spreads it. This is what all children are - lights capable of spreading. The role of teachers is to spark this inner light. Headteacher of Prettygate Infants, Mrs. Jackson said - "The Diwali Party which your family helped organise was the best ever event in our school, and this assembly also shows how the message of Diwali is Universal. When your seven year old son Meerav did the assembly, he inspired other children to be bold and to share their culture with others. Thank you very much."